The big question surrounding Long Island City’s real estate boom of the last few years is when the national retailers will come to the residential-heavy western Queens enclave. Related Companies, one of the developers to plant a flag in LIC, answered it in recent weeks by signing CVS/pharmacy to Hunter’s Point South Commons. Read more here. Joining a community garden or growing herbs on your kitchen windowsill are two tried-and-true methods for New York apartment dwellers to keep their green thumbs active. Now some new developments are offering residents space in on-site gardens, and at least one has created a farm on the building’s property. Read more here. Because Affordable Housing Could Look Like This. Read more here. 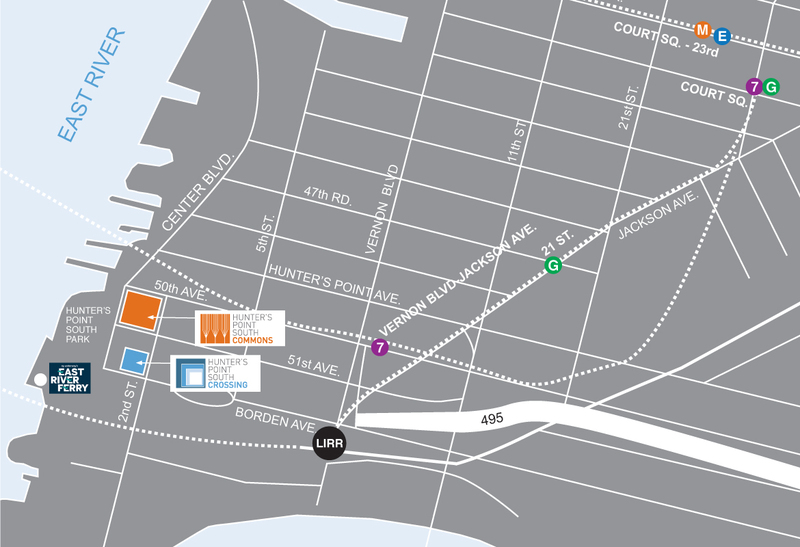 Tour Hunters Point South's Amenity-Packed Affordable Rentals. Related, Monadnock, and Phipps Houses' two affordable developments at Hunters Point South on the Long Island City waterfront are no longer just building shells promising lucky future tenants low rents, 27,000 square feet of bonkers amenities, and incredible views, as they were when we last visited in December; the towers, Hunters Point South Commons and Crossing, are now mostly complete, with move-ins beginning and amenity space buzzing, literally. Read more here. Rooftop Farm a Tasty Amenity at Queens Development. The view can't be beat. What's growing, you want to eat. It's a rooftop farm 13 stories above Long Island City. "We're looking at something a little bit cliche, but planting a seed in the community so to speak and this garden is a great way to do that," said said Frank Monterisi, Senior Vice President at Related Companies. Read more here. Hunters Point South Should Be the New Gold Standard for Affordable Housing - Right about now, the world’s best architects should be elbowing each other out of the way in a rush to New York. The city is primed for another golden age, not just of designer skyscrapers and expanding museums, but of rental buildings where ordinary New Yorkers can live without pawning a kidney. Read more here. The development of tall, glassy, high-rent towers has been booming on the western Queens waterfront for a few years now, but the area has yet to see assubstantial a stake in affordable housing as with the two in-development Hunters Point South towers by Related Companies along with Phipps Houses. The 925 apartments shared between the two… Read more. Residents are moving into the highly sought-after Hunter's Point South affordable living apartments in Long Island City. See the video here.